Dimensions: 3.75" X 6" X 0.13"
A former Protestant minister's own gripping story--how he was led to the Catholic Church by reading his Bible. Many Bible quotes. A real knock-out. Don't miss it. 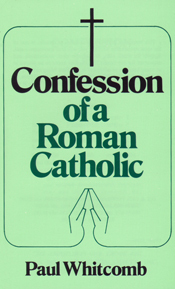 Paul Whitcomb was a Catholic author of two spiritual booklets: Confession of a Roman Catholic and The Catholic Church has the Answer. Both of these were initially published around 1958 and 1961, respectively, by the Loyola Book Company, California. They were later reprinted by TAN in 1985 and 1986. A former Protestant minister, Mr. Whitcomb was converted to Catholicism through laborious reading and comparison of the Holy Scriptures. He recounts his conversion story step-by-step in Confession of a Roman Catholic.